I received an email today from a friend who shall remain nameless (yes I do have friends, so behave). At one point she asked why there had been little or no recent activity on Well Bowled, Harold. This person is a dear friend who knows little about cricket but to my eternal gratitude supports my blog-scribbling endeavours and even professes to enjoy the various 'witticisms and cricketing passion' (her words I assure you, not mine) of my various attempts at filling in some space on these here pages. I think that her assumption was that the 'Calamity Down Under' (as the 2013/14 Ashes series will now be known as in my mind) had so demolished my obsession with god's own game that I no longer had the will to put pen to paper - or rather, finger to keyboard - on the whole sorry affair. Well she was partly correct. In the last couple of weeks I have lost count now on the number of pages and articles that have been produced on the proposed causes and repercussions of the 'Calamity Down Under', so I'm not going to add much more at this stage. One of the chief reasons is that even now for the life of me I'm not too sure where, when and how the whole disastrous affair actually happened. However it goes without saying the the ever increasing depression that came with viewing the demolition of the so-called favourites for the series, by a team that turned out to be superior on every level, was at times too much to bear. The horror of the 'Calamity Down Under' was also combined over the holiday period with arguably the worst case of stomach bug illness that I have ever had. I won't bore you with the grimy and rather unpleasant details of the illness - lets just say that the low point of the whole sorry affair was the moment that saw me with my head over the toilet whilst in the background I could hear the bewildered TMS commentary trying to describe KP's swipe & out to long-on in the Perth Test match. It wasn't KP's (or my) best moment if truth be told. 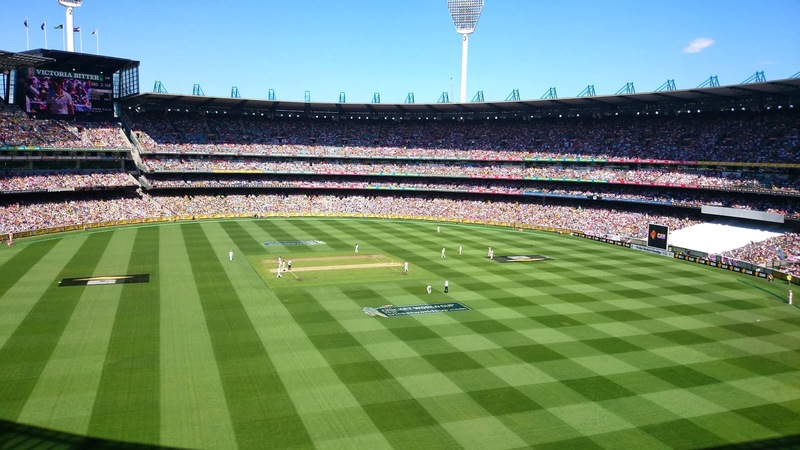 So the series of unfortunate events, both here and in Australia, set me to thinking about what I could do to while away the Ashes blues and instead dwell upon some of the things that I love about the game, some things about the game I don't like and even a few things that get right on my blooming nerves. So between now and the beginning of the English cricketing summer (please god, sunshine and warmth come soon) I'll spend a little time self-indulgently mulling over some of the things that are special to me. So, ladies and gentlemen, I give you the Well Bowled, Harold A-Z of cricket. So hands up those of you who thought that A would stand for Ashes or Australia? We'll this is my list, my blog and my rules - and most of all, my personal list of important things, so put those hands down. Auntie Anne wasn't a real Aunt. No, she was a friend of my mums when I was but a slip of a lad, but I always called her Auntie Anne - and that never changed, even when I was all grown up..... "But what the heck has a Auntie who wasn't a real Auntie got to do with Cricket?" I hear you ask (or complain). Well the answer is simple - let me explain. It was the summer of 1974, I was seven years old and my mum was at a loss. The schools were out for summer and she had no one to look after the apple of her eye (that's me by the way) while she covered an emergency shift at the hospital. That was until she hit upon the idea of asking, yes you've guessed it, to ask her friend to look after me for the day. The problem was, I wasn't a particularly happy chappy about this - It was the beginning of the summer holidays and I was was seven, I wanted to be free and wild to do my own thing. It was well before the days of the interweb and online (or even offline) gaming, so all this seven year old kid wanted to do was mess about with his mates building tree dens, playing water bottle fights and generally getting up to no good (though of course all in the best possible taste as my dad would have royally kicked my arse if I had of been very bad). ......but no, I had little choice. So that very morning my mum and I were off on a bus journey across town for me to spend the day being looked after by a nice lady with lots of juice, sweets and the finest home-made chocolate biscuits this side of heaven - but she had no children and not even a tree in sight in which to make a den in. Now this seven year old at this juncture in my life I was football mad, and it was all so very easy. My team was (and to my eternal pain, still is) Leeds United - and quite frankly we had been ruling the world, well almost. 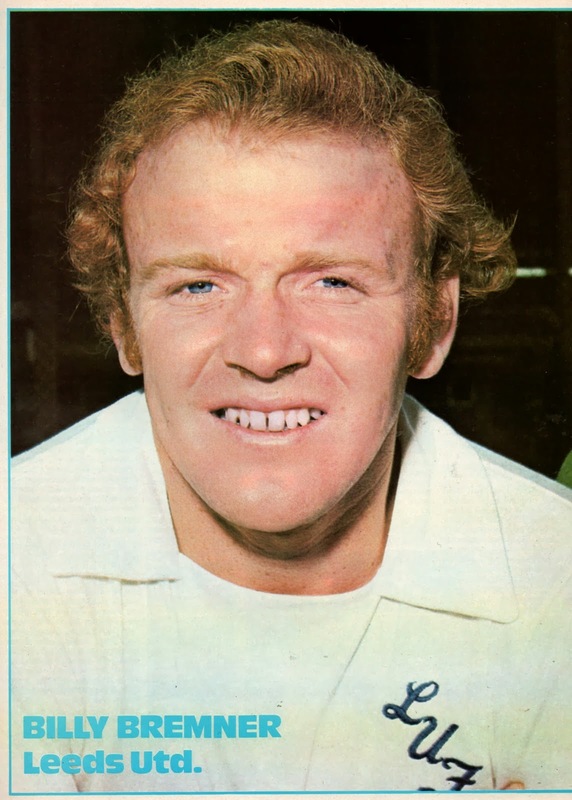 My sporting hero was a red-haired midfield maestro from Scotland and that was that. Football was everything to me and my friends. Cricket was something I was aware of, after all, I was growing up in Yorkshire so how could it not be? But it had never truly registered in my mind, or leisure activities - but this was about to change. I remember the day when I was dropped off at Auntie Anne's house as being the type of day that would strike horror into any young boys heart - was was dank, grey and drizzly (or as my Aussie friends would probably say, a normal English summer's day then). So playing out wasn't an option, the only thing for her to do was to sit me in front of the TV. Now to those of a younger disposition, that might not seem such a bad thing in view of the pleasures that channel hopping can bring to some - but you need to know one thing, and it is knowledge that often strikes fear and disbelief into those of the modern generation. The fact is that in 1974 Britain we had three television channels - yes that's right THREE......god it was a veritable stone age. Not only that but the daytime children's TV usually consisted of a few re-runs of The Banana Splits and a documentary of the wandering habits of African Wilder-beast. I wanted to go out and play in the rain - she said no, I was going to sit with some home-made biscuits and watch some television until it became brighter. So this particular rainy June morning in the North of England found me sat and bored in front of a TV with absolutely nothing worthwhile to watch. Well, that was until turned over to the BBC channel where the latest Test match between England and India was in full swing. I decided to munch on my biscuits and give it a go. For a moment I was perplexed as to why the game was taking place in glorious sunshine until I was advised politely by Auntie Anne that it was taking place at somewhere mysteriously called 'Lords', which was in the faraway distant land of the South of England - a veritable other country to this seven year old. As chance would have it I had switched over just seconds after we had lost a wicket and our next batsman was wandering into the middle. The man I saw for some reason defied all what I thought a cricketer looked like. Not only was he a giant of a man but he was walking, no actually he wasn't wasn't just walking, he was more like swaggering to the middle with an obvious air of confidence and charisma akin to some movie star. As he stood at the wicket, his striking blonde hair waving in the wind and nonchalantly chewing gum, he winked at the bowler with an obvious touch of arrogant dismissal. This was the day I would find an obsession with this game and with it find my first boyhood hero of cricket. 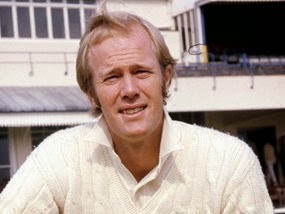 The Cricketer in question was Tony Greig. Originating from South Africa, the son of Scottish parents he had travelled to the UK in his teens, making his debut for Sussex in 1966. By the time I was formally introduced to Greigy by my Auntie Anne on this summers morning he'd achieved his first cap for England two years previously. It is no exaggeration to say that for the rest of that day I was mesmerised by the proceedings. England were already in a dominate position before he came in to bat (this was to be a complete disaster of a tour for the much vaunted Indian team). Together with Dennis Amiss he proceeded to play with an aggression and passion that was intoxicating - he was good and he knew it. Not only that, he clearly loved to play. If memory serves me correctly, he score a century that day - and its safe to say I was a fan. For me, it's always seemed a shame that the many controversies on the pitch ( e.g the infamous Kalicharan run out - something which he was perfectly entitled to do, but in the end was forced to apologise for), as well as off-the pitch controversies such as the ' we'll make them grovel' prediction for the West Indies series have tended to obscure and overshadow what an exceptional Cricketer Greig actually was. All that controversy and barely a mention of a the daddy of them all, a certain Mr Kerry Packer. A career test record which included a total of 3599 ( an average of 40.43) and a total of 141 test wickets ( at 32.20) puts him in the pantheon of English all rounders. Measure that record against a certain I.T Botham who scored 5200 runs ( an average of 33.54 ) and took 383 wickets ( at 28.40). Yet Greig only played 58 test matches as opposed to Botham's 102! His records as Test captain - played 14, won 3, lost 5 and drawn 6 is arguably still with it's merits with the 3 wins coming in the 1976/77 tour of India, a place where we hadn't won a series in the 15 years before. I personally think is is criminal that Tony Greig is remembered solely in some circles as the captain who led cricket into its biggest crisis of the last century. He lost the captaincy in the most controversial of circumstances when it became clear that he was actively recruiting players for Kerry Packer's World Series Cricket. Even up until his death at the hands of Cancer in late 2012 he was never fully forgiven for his part in a series of events which almost tore world cricket apart - and yet in many ways the actions of his and the other 'rebels' has far more long term benefits for players and fans than anybody could have ever envisaged. Moreover, both as captain and during the Packer episode, he instilled a level of support and loyalty from his players that was rock solid and never wavered. 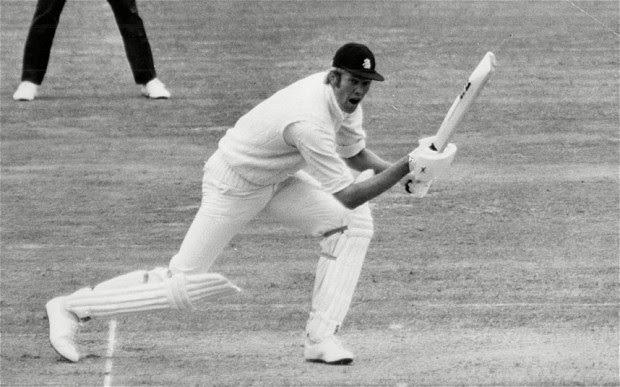 Mike Brearley, when taking over the captaincy from Greig, continually fought Tony's corner to keep in in the side. Indeed, Brearley has acknowledged the quality and togetherness of the England side he inherited as captain. So the summer of 1974 presented me with my first cricketing hero, and quite frankly no-one ever has surpassed that, though many have come close. Nothing ever quite matches up to ones first love (in whatever form it may take). It is to my eternal sadness that over the years the occasional meetings with Auntie Anne became less and less until, as often happens to us all, until all contact was lost. When I received a phone a few years ago from my mum saying that she had died my first reaction was to to be transported back to my fledgling youth and recall with with genuine affection my introduction from her to Cricket. I never got the chance to thank (or in the case of the 'Calamity Down Under') blame her for being the instigator of my lifelong love for Cricket and in the process providing me with my first and greatest cricketing hero. So I'm saying it now - thanks Auntie, for the cricket and while I'm at it, for the biscuits too.